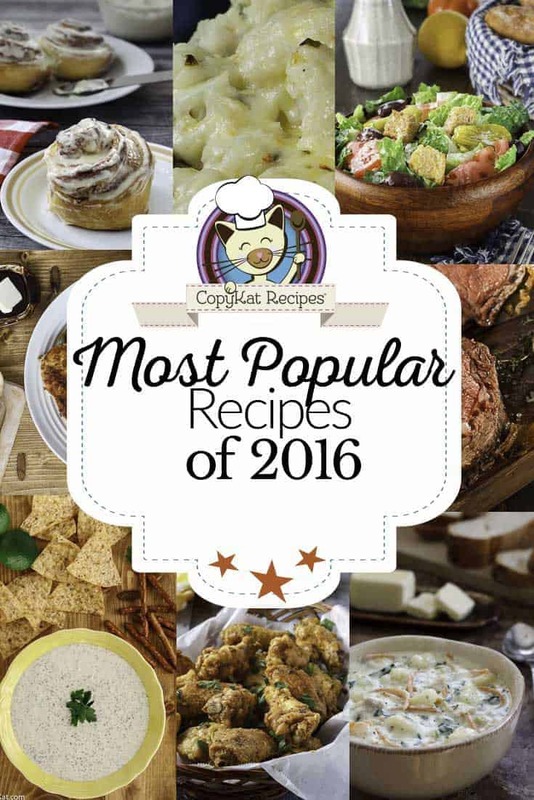 Do you wonder what the most popular CopyKat recipes were last year? Here is my top ten list of most popular recipes of 2016. Instant Pot Beef Stew – If you have an Instant Pot, or a pressure cooker, you are going to be amazed at this great recipe. It has over 8 thousand pins. Baked Cauliflower with Monterey Jack Cheese – Are you looking for a new way to prepare Cauliflower? This gratin is super easy to make, but the special item here is a spiced Monterey Jack cheese to make the flavor extra special. Mexican Cornbread Casserole – My Mexican Cornbread has been a popular recipe for years. This is a great casserole to make during the week. Olive Garden Chicken Scampi – You are going to notice a theme on my list, and that would be Olive Garden. This dish combines shrimp and chicken over pasta. Chuys Creamy Jalapeno Dip – This was one of my most requested recipes before I put this one up on the blog. If you go to Chuys you are going to want to get some of this sauce. Cinnabon Frosting – this frosting is perfect for cinnamon rolls, cupcakes, and so much more. Papa Johns Garlic Dipping Sauce – I think this is one of the best things about their pizza is their sauce to dip the pizza bones into. Wingstop Garlic Parmesan Chicken Wings – There is always a big game day coming up. Don’t miss out on these wings! Olive Garden Salad Dressing – Yes, you can buy this salad dressing in many places now. Perhaps you want to try it without all of the preservatives, or perhaps you want to make a couple of tweaks. Olive Garden Chicken Gnocchi Soup – Hands down this has been one of my most popular recipes for years. It is my copycat recipe for the Olive Garden Chicken Gnocchi. Everyone loves this recipe. How to Make the Perfect Roast Beef – Do you find making roast beef daunting? You can make this delicious roast beef for any one of your family meals easily with these instructions. Do u know where to buy or how to make the brighton hotdog shoppes cheese sauce? Do you have a recipe for roasted potatoes soup from The Atlanta Bread Company? Do you have a copycat recipe for Krystal’s Chili? Do you have a pizza sauce recipe with a kick like Boston pizza? I don’t have a similar recipe. I have never had Boston Pizza. Copykat Cinnabons – Buns from Heaven are my go-to cinnamon roll recipe. Gigantic batch, delicious, and taste exactly like Cinnabons! Great recipes, the zuppa toscana is out of this world and sooo easy.